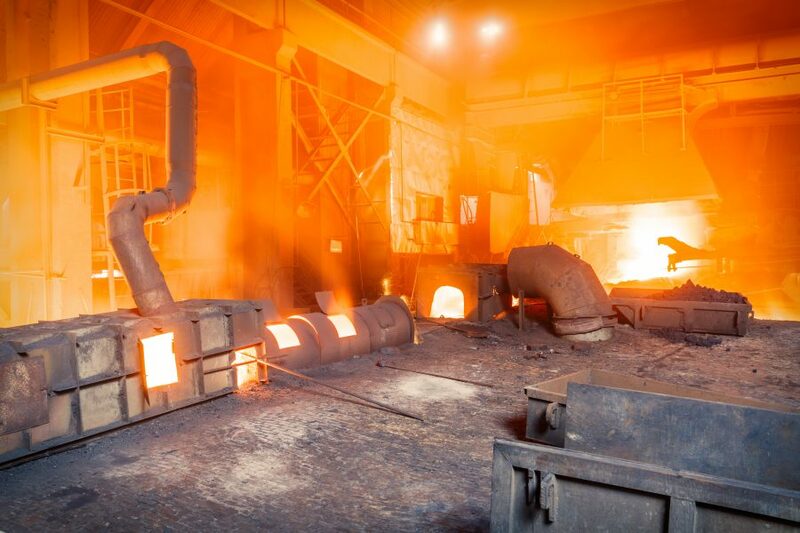 LONDON, Nov 24 (Reuters) – A recognition that electric vehicles (EVs) are unlikely to move the nickel demand dial for some years, slowing demand from China's stainless steel mills and rising supplies have halted a frenzied price rally and are likely to keep weighing on prices. Benchmark nickel on the London Metal Exchange soared by 50 percent from mid-June to a two-year peak of $13,030 a tonne on Nov. 1, based largely on expectations of strong demand to make the rechargeable batteries used to power EVs. Since then the price has eased back to about $12,000. Wood Mackenzie analysts estimate nickel demand in EV batteries will rise to about 220,000 tonnes in 2025 from about 40,000 tonnes last year. Total global demand of about 2 million tonnes this year is forecast to rise to 2.2 million tonnes by 2025. "Over the next few years the battery sector will not be affected by the availability of nickel supply," said Anton Berlin, head of strategic marketing at Nornickel, one of the world's largest nickel producers. 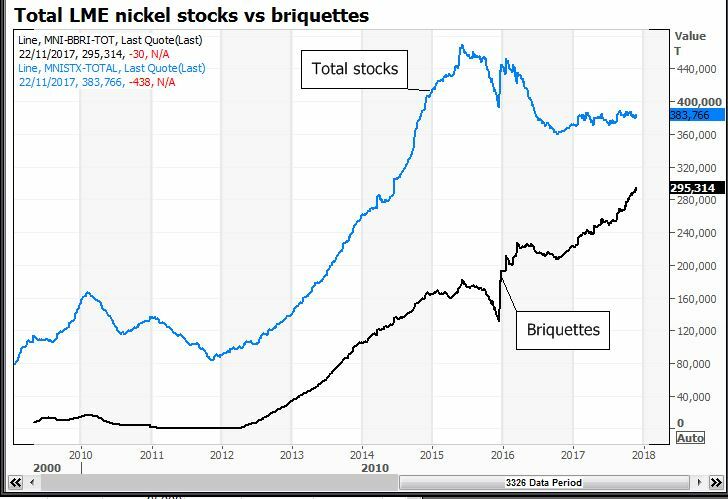 Berlin told an investors' presentation this week that Nornickel expects the market to remain "fairly balanced" in the longer term and able to supply all the nickel needed, including that for rechargeable batteries, for the next five years. "We can see that the stockpiles are there, so we can find enough metal to satisfy that demand until 2022." Stocks of nickel in LME warehouses stand at 382,362 tonnes, of which about 75 percent is bagged briquette, easily crushed into small particles and dissolved in sulphuric acid to make nickel sulphate used in batteries. "Briquette stocks don't suggest an imminent shortage," said Jim Lennon, founder of Red Door Research. 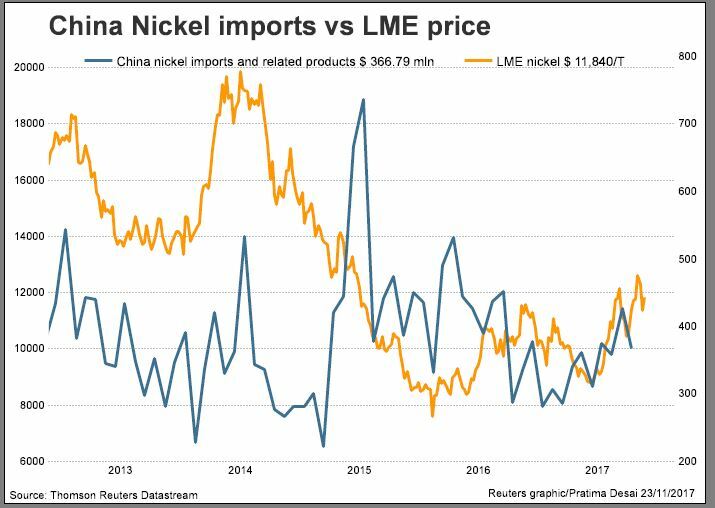 "Nickel demand in China is weakening after a period of restocking; stainless mills have over produced." China accounts for about half of global nickel consumption, most of it by stainless steel mills. 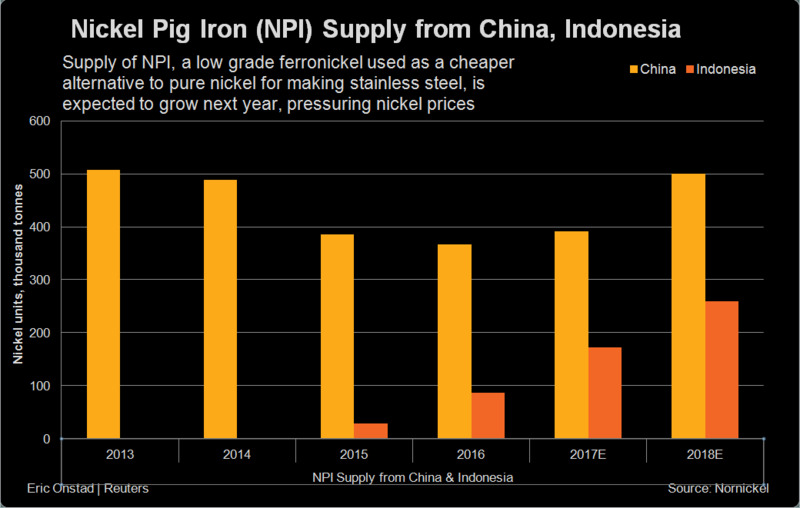 Analysts said weaker demand from these mills means that China's demand that nickel pig iron producers in the Shandong province curb output from mid-November to mid-March is unlikely to boost imports. 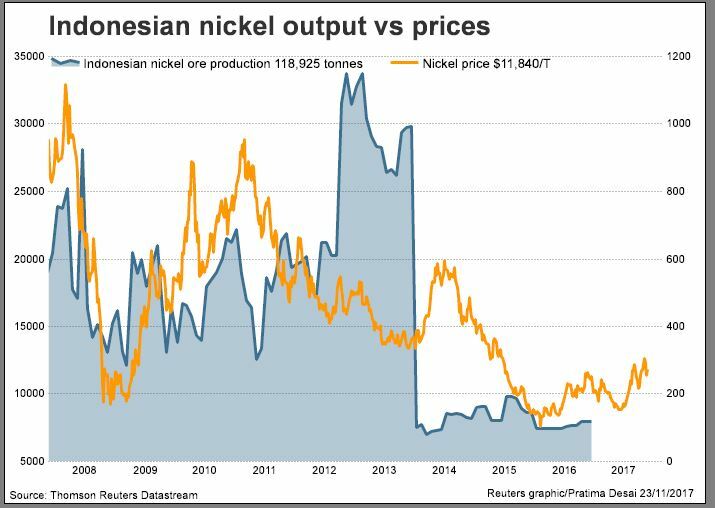 On the supply side, the gradual lifting of a government ban by major producer Indonesia on raw material exports, imposed in early 2014, has seen more nickel ore make its way onto world markets, particularly to China. The latest news of increased supply has come from state-owned diversified miner PT Aneka Tambang Tbk (Antam), which is aiming to boost sales of nickel ore by more than 160 percent next year to 11 million tonnes, from an estimated 4.2 million tonnes this year. "Indonesians are going to ramp up their exports. That could mean higher Chinese NPI production," Lennon said. "We should see more supply coming out of the Philippines as well." Nickel ore output in the Philippines fell this year because of mine suspensions after a government environmental crackdown. "Some of those mine suspensions will be lifted soon," one commodity trader said. 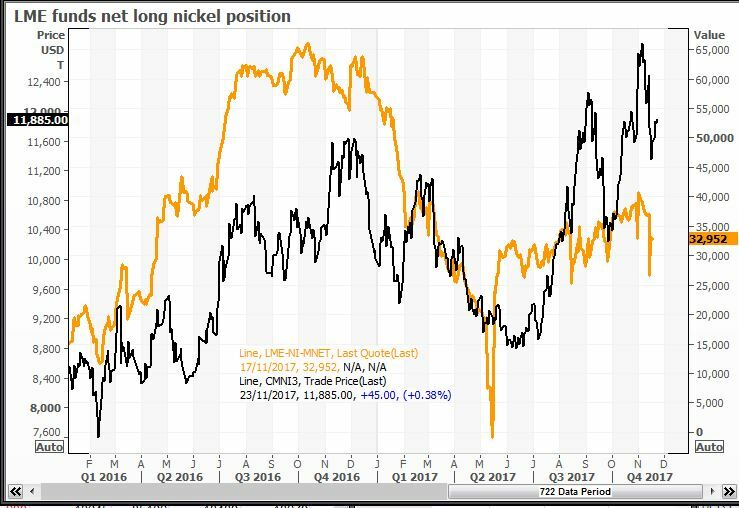 "There's been a fair amount of profit-taking on long nickel positions on the LME." Funds' net long nickel positions on the LME at 32,952 lots, or nearly 200,000 tonnes, are down from more than 40,000 lots on Nov. 1. (Reporting by Pratima Desai and Eric Onstad; editing by David Goodman).